How to Cite This Chapter: Oczkowski W, Bodzoń W, Frołow M. Stenosis of the Carotid and Vertebral Arteries. McMaster Textbook of Internal Medicine. Kraków: Medycyna Praktyczna. https://empendium.com/mcmtextbook/chapter/B31.II.2.28 Accessed April 19, 2019. Meschia JF, Bushnell C, Boden-Albala B, et al; American Heart Association Stroke Council; Council on Cardiovascular and Stroke Nursing; Council on Clinical Cardiology; Council on Functional Genomics and Translational Biology; Council on Hypertension. Guidelines for the primary prevention of stroke: a statement for healthcare professionals from the American Heart Association/American Stroke Association. Stroke. 2014 Dec;45(12):3754-832. doi: 10.1161/STR.0000000000000046. Epub 2014 Oct 28. 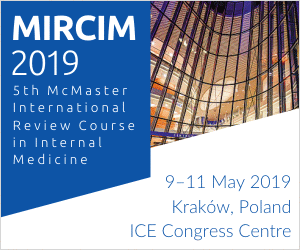 PubMed PMID: 25355838; PubMed Central PMCID: PMC5020564. European Stroke Organisation, Tendera M, Aboyans V, Bartelink ML, et al; ESC Committee for Practice Guidelines. ESC Guidelines on the diagnosis and treatment of peripheral artery diseases: Document covering atherosclerotic disease of extracranial carotid and vertebral, mesenteric, renal, upper and lower extremity arteries: the Task Force on the Diagnosis and Treatment of Peripheral Artery Diseases of the European Society of Cardiology (ESC). Eur Heart J. 2011 Nov;32(22):2851-906. doi: 10.1093/eurheartj/ehr211. Epub 2011 Aug 26. PubMed PMID: 21873417. Brott TG, Halperin JL, Abbara S, et al; American College of Cardiology Foundation; American Stroke Association; American Association of Neurological Surgeons; American College of Radiology; American Society of Neuroradiology; Congress of Neurological Surgeons; Society of Atherosclerosis Imaging and Prevention; Society for Cardiovascular Angiography and Interventions; Society of Interventional Radiology; Society of NeuroInterventional Surgery; Society for Vascular Medicine; Society for Vascular Surgery. 2011 ASA/ACCF/AHA/AANN/AANS/ACR/ASNR/CNS/SAIP/SCAI/SIR/SNIS/SVM/SVS guideline on the management of patients with extracranial carotid and vertebral artery disease: executive summary. A report of the American College of Cardiology Foundation/American Heart Association Task Force on Practice Guidelines, and the American Stroke Association, American Association of Neuroscience Nurses, American Association of Neurological Surgeons, American College of Radiology, American Society of Neuroradiology, Congress of Neurological Surgeons, Society of Atherosclerosis Imaging and Prevention, Society for Cardiovascular Angiography and Interventions, Society of Interventional Radiology, Society of NeuroInterventional Surgery, Society for Vascular Medicine, and Society for Vascular Surgery. Circulation. 2011 Jul 26;124(4):489-532. doi: 10.1161/CIR.0b013e31820d8d78. Epub 2011 Jan 31. Erratum in: Circulation. 2011 Jul 26;124(4):e145. Dosage error in article text. PubMed PMID: 21282505. Chambers BR, Donnan GA. Carotid endarterectomy for asymptomatic carotid stenosis. Cochrane Database Syst Rev. 2005 Oct 19;(4):CD001923. Review. PubMed PMID: 16235289. Chimowitz MI, Lynn MJ, Howlett-Smith H, et al; Warfarin-Aspirin Symptomatic Intracranial Disease Trial Investigators. Comparison of warfarin and aspirin for symptomatic intracranial arterial stenosis. N Engl J Med. 2005 Mar 31;352(13):1305-16. PubMed PMID: 15800226. Atherosclerosis is the cause of >90% of all cases of stenosis or occlusion of the carotid arteries and most cases of stenosis of the vertebral arteries; rare causes include postradiotherapy stenosis, systemic vasculitis, spontaneous or traumatic artery dissection, and fibromuscular dysplasia. Carotid or vertebral artery stenosis may be symptomatic or asymptomatic. 1) Motor or sensory disturbances contralateral to the stenosis. 2) Speech disorder in the case of stenosis of the artery supplying the dominant hemisphere. 3) Inattention or neglect in the case of stenosis of the artery supplying the nondominant hemisphere. 3) Monocular visual disturbances ipsilateral to the stenosis (amaurosis fugax). 1) Motor or sensory disturbances with cranial nerve involvement. 2) Crossed motor or sensory disturbances (face ipsilateral, arm and leg contralateral). 3) Gait ataxia especially if associated with limb ataxia or the symptoms and signs listed above. Auscultation for a carotid bruit is not sufficient to confirm or exclude carotid stenosis and should not be used for this purpose.Evidence 1Strong recommendation (downsides clearly outweigh benefits; right action for all or almost all patients). Moderate Quality of Evidence (moderate confidence that we know true effects of the intervention). Quality of Evidence lowered due to imprecision and indirectness. Ratchford EV, Jin Z, Di Tullio MR, et al. Carotid bruit for detection of hemodynamically significant carotid stenosis: the Northern Manhattan Study. Neurol Res. 2009 Sep;31(7):748-52. doi: 10.1179/174313209X382458. Epub 2009 Jan 7. PubMed PMID: 19133168; PubMed Central PMCID: PMC2727568. Computed tomography (CT) or magnetic resonance imaging (MRI) of the brain should be done to identify cerebral infarction and to exclude hemorrhage. MRI is more sensitive for detecting ischemia than CT, especially in the posterior fossa. Color Doppler ultrasonography can accurately locate the atherosclerotic plaque, assess its morphology, and determine the severity of stenosis in carotid artery disease but not vertebral disease or intracranial disease. Magnetic resonance angiography (MRA) or computed tomography angiography (CTA) should be done to confirm the degree of stenosis and assess for vertebral or intracranial stenosis.Evidence 2Strong recommendation (benefits clearly outweigh downsides; right action for all or almost all patients). Moderate Quality of Evidence (moderate confidence that we know true effects of the intervention). Quality of Evidence lowered due to imprecision. Chappell FM, Wardlaw JM, Young GR, et al. Carotid artery stenosis: accuracy of noninvasive tests--individual patient data meta-analysis. Radiology. 2009 May;251(2):493-502. doi: 10.1148/radiol.2512080284. Epub 2009 Mar 10. PubMed PMID: 19276319. Because of the risk of complications, arteriography is reserved for situations when the severity or cause of stenosis cannot be assessed using other modalities. 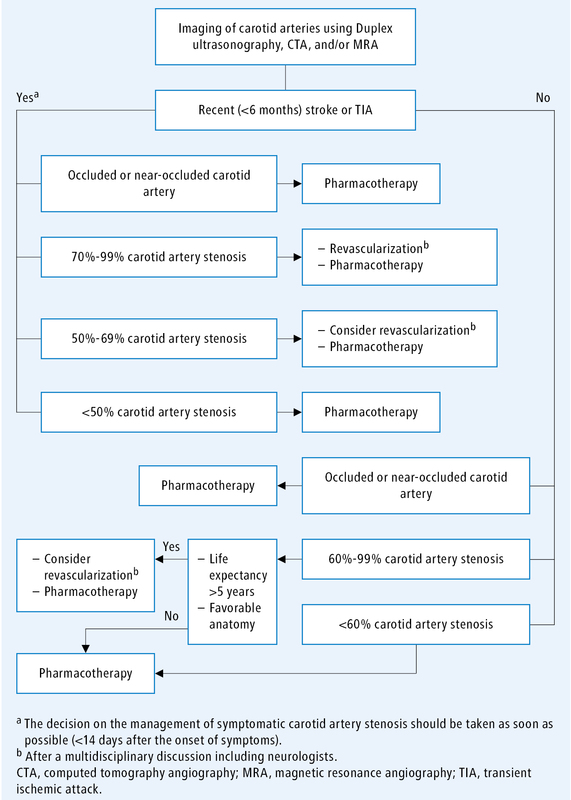 Management algorithm in carotid artery stenosis: Figure 1. 1. Management of risk factors for atherosclerosis: see Prevention of Cardiovascular Diseases. Use a statin in all patients, including those with asymptomatic stenosis. Make attempts to control diabetes mellitus. Smoking should be strongly discouraged. 2. Antiplatelet treatment: All patients should receive lifelong treatment with acetylsalicylic acid (ASA) 75 to 325 mg/d. If ASA is contraindicated, use clopidogrel 75 mg/d. For symptomatic intracranial disease, administer 2 antiplatelet agents for 90 days.Evidence 3Strong recommendation (benefits clearly outweigh downsides; right action for all or almost all patients). Moderate Quality of Evidence (moderate confidence that we know true effects of the intervention). Quality of Evidence lowered due to indirect comparison. Derdeyn CP, Chimowitz MI, Lynn MJ, et al; Stenting and Aggressive Medical Management for Preventing Recurrent Stroke in Intracranial Stenosis Trial Investigators. Aggressive medical treatment with or without stenting in high-risk patients with intracranial artery stenosis (SAMMPRIS): the final results of a randomised trial. Lancet. 2014 Jan 25;383(9914):333-41. doi: 10.1016/S0140-6736(13)62038-3. Epub 2013 Oct 26. PubMed PMID: 24168957; PubMed Central PMCID: PMC3971471. Some physicians add clopidogrel 300 mg as a loading dose to ASA followed by 75 mg/d for 21 days in patients with a recent TIA or minor stroke and extracranial carotid disease (see Stroke). After endovascular angioplasty and stenting, our practice—acknowledging the lack of high-quality evidence to determine the duration of treatments—is to administer 2 antiplatelet agents for at least 30 days and ASA indefinitely. 1) Stenosis eligible for invasive treatment in a patient with general contraindications to surgery. 2) Severe cardiac or pulmonary disease. 4) Stenosis that is inaccessible to the surgeon for anatomical reasons. 5) Restenosis of the internal carotid artery after endarterectomy. Medical management is usually preferred over a surgical or endovascular intervention for patients with asymptomatic carotid stenosis.Evidence 7Weak recommendation (benefits likely outweigh downsides, but the balance is close or uncertain; an alternative course of action may be better for some patients). Moderate Quality of Evidence (moderate confidence that we know true effects of the intervention). Quality of Evidence lowered due to indirectness (relative lack of contemporary studies of the subject). Hart RG, Ng KH. Stroke prevention in asymptomatic carotid artery disease: revascularization of carotid stenosis is not the solution. Pol Arch Med Wewn. 2015;125(5):363-9. Epub 2015 Apr 17. PubMed PMID: 25883075. Chambers BR, Donnan GA. Carotid endarterectomy for asymptomatic carotid stenosis. Cochrane Database Syst Rev. 2005 Oct 19;(4):CD001923. Review. PubMed PMID: 16235289. 2. Vertebral or basilar artery stenosis: In patients with symptomatic or asymptomatic vertebral or basilar artery stenosis, dual antiplatelet treatment for 90 days after a neurologic event and single antiplatelet treatment indefinitely is recommended over invasive treatment.Evidence 8Strong recommendation (benefits clearly outweigh downsides; right action for all or almost all patients). High Quality of Evidence (high confidence that we know true effects of the intervention). Derdeyn CP, Chimowitz MI, Lynn MJ, et al; Stenting and Aggressive Medical Management for Preventing Recurrent Stroke in Intracranial Stenosis Trial Investigators. Aggressive medical treatment with or without stenting in high-risk patients with intracranial artery stenosis (SAMMPRIS): the final results of a randomised trial. Lancet. 2014 Jan 25;383(9914):333-41. doi: 10.1016/S0140-6736(13)62038-3. Epub 2013 Oct 26. PubMed PMID: 24168957; PubMed Central PMCID: PMC3971471. Antiplatelet treatment is recommended over anticoagulation in patients with symptomatic or asymptomatic vertebral or basilar stenosis.Evidence 9Strong recommendation (benefits clearly outweigh downsides; right action for all or almost all patients). High Quality of Evidence (high confidence that we know true effects of the intervention). Chimowitz MI, Lynn MJ, Howlett-Smith H, et al; Warfarin-Aspirin Symptomatic Intracranial Disease Trial Investigators. Comparison of warfarin and aspirin for symptomatic intracranial arterial stenosis. N Engl J Med. 2005 Mar 31;352(13):1305-16. PubMed PMID: 15800226. Figure 1. Management algorithm for carotid artery stenosis. Adapted from the 2011 European Society of Cardiology guidelines (see Additional Information for details).